Manufacturer: Cipla Limited / Emcure Pharmaceuticals Ltd.
300mg × 10 tablet $ 10.39 $ 103.95 Buy Now! 300mg × 20 tablet $ 9.45 $ 188.95 Buy Now! 300mg × 30 tablet $ 9.16 $ 274.95 Buy Now! 300mg × 40 tablet $ 8.80 $ 351.95 Buy Now! 300mg × 50 tablet $ 8.58 $ 428.95 Buy Now! 300mg × 60 tablet $ 8.32 $ 498.95 Buy Now! 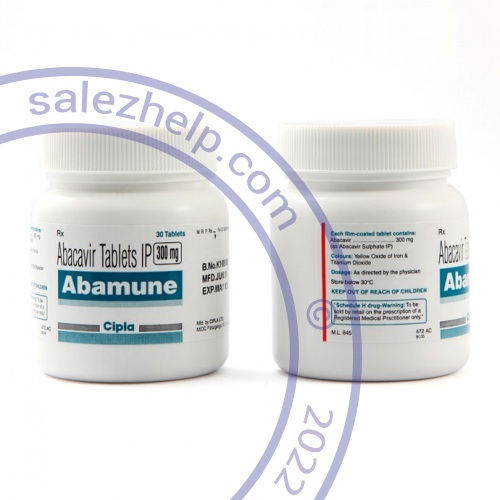 ABACAVIR is an antiretroviral drug. It is used with other medicines to treat HIV. This medicine is not a cure for HIV. It will not stop the spread of HIV to others. Take this medicine by mouth with a glass of water. You may take this medicine with or without food. Take your medicine at regular intervals. Do not take your medicine more often than directed. For your anti-HIV therapy to work as well as possible, take each dose exactly as prescribed. Do not skip doses or stop your medicine even if you feel better. Skipping doses may make the HIV virus resistant to this medicine and other medicines. Do not stop taking except on your doctor's advice. Talk to your pediatrician regarding the use of this medicine in children. While this drug may be prescribed for children as young as 3 months old for selected conditions, precautions do apply. Store at room temperature between 20 and 25 degrees C (68 and 77 degrees F). Do not freeze. May be refrigerated. Throw away any unused medicine after the expiration date.